How to make the transition from your market research to your business plan? This is the last of the 7 steps of our market research methodology. Today we will discuss why market research needs to be seen as an input to your business and financial plans. The business plan sums up all your predictions for your future business. It needs to be backed up with facts and figures to convince your bank, your partners and investors. 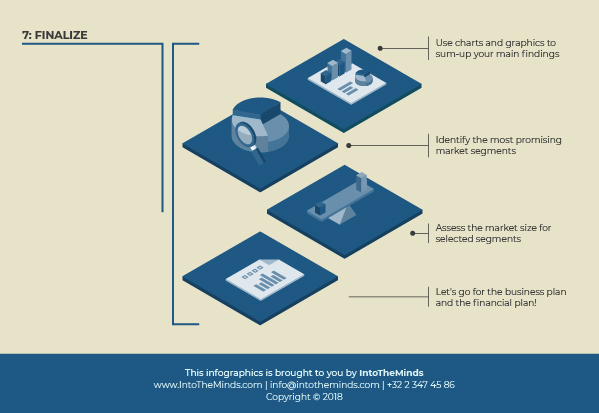 How can you do a financial plan without market research? The financial plan is an instrumental part of the business plan. It shows the financial projections of your venture and must prove that the case is profitable. How can you do a financial plan without knowing those essential pieces of information? Market research aims at answering those questions. We hope our market research methodology will help make your project a success. Feel free to share your comments, critics, suggestions at the bottom of this article or on social media: Twitter, Linkedin, Facebook. We’ll be happy to respond.